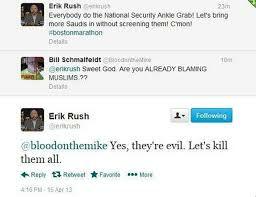 Following the deadly explosions near the finishing line of the Boston Marathon yesterday, leaving three people dead and at least 140 injured, the reactions by Muslims, Islamophobes and those who do no fit into those two categories have been highly revealing. While it does little good to speculate, speculation whether the perpetrator was a Muslim or not ensued straight after the bombings. #Muslims began trending on Twitter. This is something shocking. While there are those who either play down Islamophobia or say that it doesn’t exist, the reaction after the bombings was Islamophobia at its worst. It showed, without doubt, an “irrational fear” of Muslims and Islam. Let’s not forget that the 2011 Norway bombings were blamed on Al-Qaeda and Muslims before it was found out it was done by Anders Breivik. Some say that we don’t use the word ‘Christianophobia’ so why do we use the word ‘Islamophobia’? Well, for a start, maybe its because anytime a bomb goes off across the world we instantly presume it to be Muslims, not Christians. It’s a perfect manifestation of the climate certain aspects of the right-wing media have created. The truth is only a tiny minority of terrorist attacks in Europe and America are carried out by Islamist extremists, you only have to look at the results from Europol and the FBI. Despite this, it hasn’t stopped Islamophobes fear mongering. The EDL leader Tommy Robinson retweeted: “Muslims have been responsible for 99.9% of terror attacks worldwide”. Footballer Joey Barton, who has over 2m Twitter followers, speculated that the bombings may have been because of the hatred of “infidels” (draw from that whatever conclusions you like). There have been others who, since the bombs exploded, were quick to play down what was happening in Boston and deflect attention to the disasters in Palestine, Syria, Iraq and other countries. While their concerns are justified and, indeed, far too often not taken seriously enough, this is not a “competition”, as one Twitter user remarked quite aptly. Yes, there were horrific attacks yesterday in Baghdad killing 33 and air raids in Syria killing 12 children, but let’s treat each disaster on its own merit, instead of unhelpfully comparing each one. Perhaps the reasons why we react so strongly whenever there is a bomb in Europe or America is simply because of the scarcity of them. It’s a sad reality that bombs go off frequently in the East and it is even more sad that many of us have become desensitised by it all. However, just because we have not become desensitised to bombings in the West is no reason to deflect attention away from them. Whether we like it or not, most of us all have a huge affiliation with America. We have grown up watching TV programmes and films produced in the States, visited DisneyLand Florida or perhaps New York City. The truth is we share probably much more with America than we do Eastern countries, so when there is a tragedy, it is natural to react with revulsion: it is, in a sense, much more closer to “home”. I find your article really interesting, but can’t help but disagree with your final argument. Mentioning that 100s of innocent civillians die elsewhere is not a way of belittling the Boston bombings. Yes, people who argue that ‘the Boston bombings are NOTHING if Syrian violence has killed x amount of people’ are deflecting from the harsh tragedy, BUT – in general, comparisons only serve (or should only serve) to highlight that many people suffering cruel and inhumane crimes, do not have a voice. Their sufferings are not widely publicised. This is something we, as privileged westerners, often forget. You mentioned that the shock from the Boston bombings rises from the fact that bombs are a scarcity over here. Yes, this is true. But I feel you are implying bombs are not shocks to people who live in other parts of the world. Are you saying that Pakistani civilians randomly hit by American drones are expecting to be killed? Doesn’t shock exist for them? If you are only shocked by a bomb hitting the western world, doesn’t it mean that you have become desensitised to the humans who suffer bombs daily, elsewhere? And that you are only curious about how people in your side of the world are suffering? Doesn’t this way of thinking only reinforce that some lives are classed by the media as more valuable than others? I agree, that comparisons to other countries suffering violence should not belittle the tragedy that we have faced. But I strongly disagree that one should not make these comparisons in the first place. We need to put sufferings into context, in the right and respectful way; 3 innocent people died in Boston who should never be forgotten. And there are also hundreds of people around the world, killed in the name of senseless injustice, who also deserve to be remembered and mourned. Thanks for your thoughts. I agree with what you said. My essential point is that a tragedy is a tragedy and a life is a life, no matter who or where it is. We, in the west have, unfortunately, become desensitised to the horrors in other countries but I don’t think comparing does any good because it can lead to the belittling of lives. The death of one innocent American because of a bomb is tragic and so is the death of 100 innocent Afghans, even though the latter is worse. A very important point well made. “News values” obviously have an impact on reporting, and cultural significance will alway result in extra coverage irrespective of magnitude. It is also undoubtable easier to unite against a perceived external ‘threat’ than have to deal with the ramifications of an attack of this kind coming from ‘within’. It will be interesting to see the response when who is responsible is established – one can only hope that people will be made aware of their own ignorance. Thank you for the post, I found it very insightful. This is so perfectly put. I liked how you said we shouldn’t compare tragedies. A lot of Muslims do have the immediate reaction of – ‘well what about the people of Iraq, Palestine etc’, I agree, they should be seen as separate things, we don’t need to deflect attention away from them. Woops, didn’t mean to send that anonymously! Thanks for the article – shared it! Very well put, I think the point of one persons life being worth more than the other should be emphasised, but very good. This is amazing! A Muslim’s view is needed! Great post!